Ford has taken the wraps off its new Ecosport - a new entrant in the rapidly growing compact cross-over segment, which was popularised in Europe by the Nissan Juke. The new Ecosport joins the 2013 Kuga in trying to establish Ford as an important force in market - but it faces tough opposition from the Peugeot 2008 and Renault Captur at its European launch. The arrival of the Ecosport means that Ford has now shown two out of three of its SUV range - with the final model, the Edge, being shown later this year. The South American-developed compact SUV shares its underpinnings with the Fiesta, and that means it will be great to drive, with accurate steering, and plenty of grip in the corners. 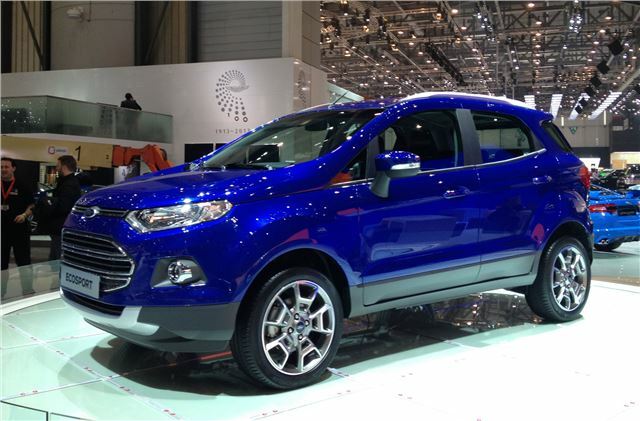 But the Ecosport is also all about ease of use and family-friendliness, which means it packs some impressive technology. From launch, certain versions will feature 'MyKey', and ‘SYNC Applink’, which allows the driver to connect his smartphone to his car, and ‘SYNC Emergency Assistance’, which helps the driver in the event of an incident. These features are described by Ford as genuine innovations in this market sector. It also will offer a comprehensive package of driver assistance technologies including Electronic Stability Program and Hill Launch Assist. The EcoSport will be powered by a full range of diesel and petrol engines, including the 125PS 1.0-litre EcoBoost petrol engine - International Engine of the Year - a 110PS 1.5-litre petrol engine, and a 90PS 1.5-litre diesel engine, which Ford expects to deliver class-leading fuel efficiency.